Erchonia could bask in its accolades for the Zerona™ Medical Laser, but the company remains aggressive, conducting additional research and testing fresh applications for its industry leading low-level laser technology. Erchonia’s Zerona™ protocol- an unprecedented, non-invasive method of performing body contouring and laser liposuction- has the medical media buzzing. Erchonia has exclusive FDA market clearance for laser-assisted liposuction to back its product safety claims. The Zerona™ protocol and low-level lasers expose practitioners and patients alike to reduced levels of radiation during treatment sessions. Studies have shown recovery periods to be brief and painless. SunrayLaser.com is excited to have the expertly refurbished Erchonia Medical Laser in inventory and ready to ship. The used Erchonia laser is portable stand-alone equipment; it rolls readily on its four sturdy casters. Two of the wheels lock into place for additional stability in any setting. 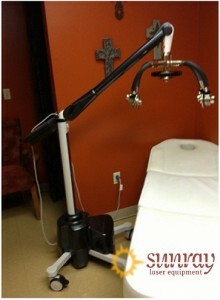 Cold and low-level laser therapies. Acne treatment and cosmetic surgery. To source high quality, late-model refurbished equipment is very difficult. SunrayLaser.com is fortunate to have a used Zerona™ laser in stock. The equipment is in excellent condition, and our price quote will surprise you! Our cosmetic laser specialists are happy to field questions regarding the Erchonia line or discuss its role in the Zerona™ protocol. Please contact us today. To get in touch, simply fill in our contact form and a qualified staff member will contact you quickly.